A close-up of th 6th Marine Division insignia painted onto a USMC veteran’s helmet. This veteran served in one of the bloodiest battles of WWII, Okinawa (source: eBay image). In a recent online auction, an amazing example of a veteran-painted pith helmet sold for less than $150. Had this helmet been a period correct M1 helmet, there is no telling how much attention it would have drawn from collectors or what incredible amount of money it would have fetched. Showing the left side of the 1945 Okinawa pith (source: eBay image). Showing the painted-on shoulder sleeve insignia of the 6th Marine Division (source: eBay image). Showing the rear of the pith with the painted “USMC” (source: eBay image). Hawley Products Company, one of the manufacturers of M1 helmet liners, made these fiberboard headgear “sun” helmets for use as protection from the intense sunlight and torrential downpours of the South Pacific tropical islands. Due to their lightweight design and construction, the term ‘helmet’ hardly seems applicable when compared to the beefy, bulky nature of the steel pot. 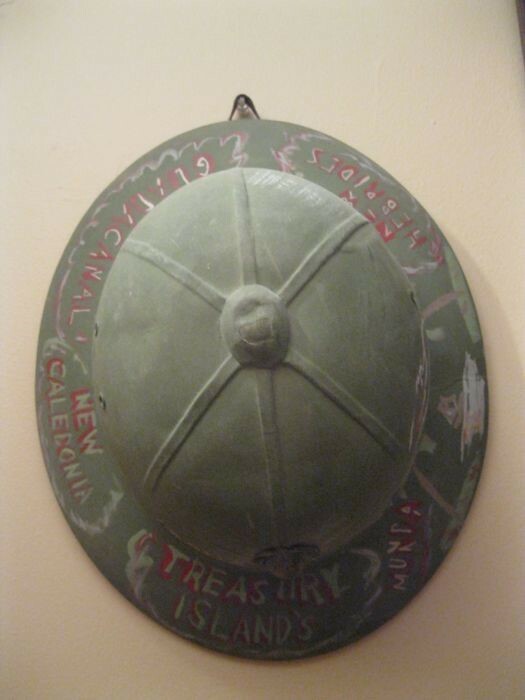 Here is a very nice example of a painted pith helmet with the Marine’s name stenciled across the bill (source: eBay image). Piths were issued to all branches and were available in two colors or tones. Green was predominantly issued to naval personnel while khaki or light brown went to army and army air forces people. Marines could be seen wearing either color as they were issued whatever was available within the supply system or they adapted to the limited stores-issue and found creative ways to <em>requisition</em> (I use this term quite loosely as some Marines were rather resourceful in cutting through the red tape of the supply system) them. A close-up of the Guadalcanal Pith and the EGA (source: eBay image). As with any creative service member deployed away from loved ones and home, artistic expression tended to be revealed on available mediums. Piths, not meant for combat, were viable canvases for these artists to modify with their own personal embellishments. Wearers <em>tended</em> to be rear echelon service-members rather than front-line combatants, but some did don the helmet near the fight. Sometimes the fight came to them while they were engaged in other in-the-rear activities. Though not as nicely embellished as the Okinawa pith, this Guadalcanal helmet would be a great addition to any collection (source: eBay image). If you’re seeking to add a visually stunning helmet to your collection but can’t afford to splurge for the painted steel pot, these pith will certainly add diversity and originality to any display. With patience and diligence applied to your searching techniques or saved searches, you will find the perfect addition. Showing the top of the Guadalcanal pith helmet (source: eBay image). Posted on June 14, 2018, in Headwear | Helmets, Military Art, Military Folk Art, USMC, World War II and tagged 6th Marine Division, 6th Marines, Okinawa, Pith Helmets, WWII. Bookmark the permalink. Leave a comment.